Your pool uses chlorine or bromine to kill micro-organisms, bacteria and algae in your pool by oxidising them. So that is where the O (Oxidation) in ORP comes from. The P (Potential) relates to a value of the amount of work that the chlorine or bromine can achieve. It’s potential to be effective, if you will. The R (Reduction) is about electron exchange, and if that sounds complicated, don’t worry because it is actually irrelevant to the application of ORP technology in swimming pools. The confusion comes about because the science has been borrowed from other areas, but ORP has become popular in water purification management because it can produce a single value which shows how affective a sanitiser might be under any given conditions rather than simply measuring the dose or concentration of sanitiser in your pool water. So ORP measures how well the sanitiser in your pool is working rather than simply how much chlorine or bromine there is in your pool. The water in your pool should be clean, clear and feel good on your skin. The way to achieve this is to kill off bacteria with a disinfectant, filter out dirt and debris and get rid of organic matter through oxidation. Bromine and Chlorine are the two chemicals most commonly used to achieve this as they work as both oxidiser and sanitiser. 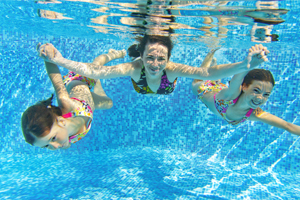 In your pool, their job is to remove any organic contaminants by oxidising them. Oxidation in water by either Chlorine or Bromine is a complicated process. Ideally the oxidation will be complete and produce little other than carbon dioxide but conditions can exist where the process is incomplete and that is when you can get that ‘chlorine smell’ and less than perfect water quality. ORP is measured in water using a very sensitive voltmeter and a platinum electrode. A reading is given in thousandths of a volt (millivolts) and that reading relates directly to the efficacy of the sanitiser being used. The range for effective sanitisation is between 650 mV and 850mV. Other values, such as pH values, chlormines or free chlorine may vary but if the ORP is above 650 mV then no pathogens will be present in the water. Almost all automated pool controllers operate on ORP measurement and management. In your swimming pool, the controller doesn’t know how much Chlorine or Bromine you have in the water. What it does know is the ORP value and as the only thing that will change that value is Chlorine or Bromine it knows how to control the dosing to maintain the desired ORP value. We hope this article has been of interest to you. There are many more articles on this site that will give you information on almost every aspect of your pool.